The very idea of visiting Madinah into the very lap of Prophet Mohamed makes you filled with inner peace and harmony. A journey of a lifetime in the company of near and dear ones is incomplete without having a proper planning in terms of transportation, lodging and transfer. No need to worry about home like staying pleasure as Al Madinah Harmony Hotel provides that longing harmony in a best manner to let you experience the grandiose of world class luxury at a single best place. 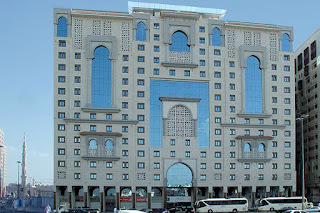 Lavish is something best attach with this 5 star hotel in Madinah that features monumental building that sure to flatter you with a very first glimpse. Inside details surely treat your eyes with majestic marble flooring best shown with artistic work and modern décor for guests to wait in the lobby without much hassle. Offering a 3-minute walking distance from Masjid Al Nabawi, this hotel in Madinah is best enough to bring to maximum luxury to your stay. Guest rooms are fully furnished with contemporary style décor along with modern piece of furniture and amenities like flat screen TV, large size bed, and air condition, free Wifi, private bathroom, complimentary toiletries and so on. No matter, if you belong to the category of leisure or business traveler, finding tranquility inside the lodging is ideal, when it just takes 15-minutes’ drive from Prince Mohammed Bin Abdulaziz Airport to reach over here.